(Update – I have also made a video for this tutorial located here. I was completely overwhelmed by all the wonderful comments everyone left when I originally posted this skirt. I never thought that such a simple garment would get such a reaction. Though I do think the cute kid had A Lot to do with it! For those who asked, I wasn’t using any candy bribes, asking her age, or anything else along those lines. It was just a really lucky shot. (The 1 out of 85 where she wasn’t looking at the dirt. lol) I have no idea why her fingers are like that, I think she was just laughing at something she said to herself! If you read the post from yesterday, you know pretty much what we’re gonna do. If you didn’t, you might want to check out the tips at the bottom even if you already know how to shirr. To determine exactly how much fabric you’ll need refer to the charts below. 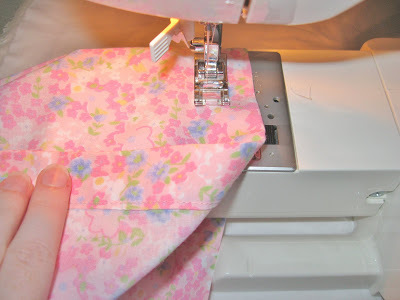 If your fabric width is too short by an inch or two don’t sweat it. This is a very forgiving process. 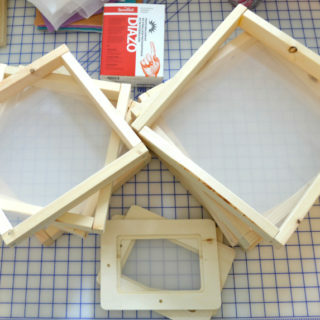 Whatever you make with the above chart will probably fit the child for 2 years or more! 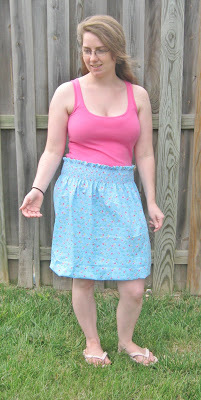 I used one rectangle that was 44 inches wide x 17 inches long to make this skirt. 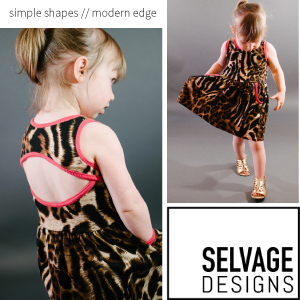 After you decide the length you would like it to be on your child, you need to add at least 2¼ inches to the top edge in order to get the “paper-bag” look. The hem can be whatever you like, but make it extra long if you want to be able to let it out a bit next year. 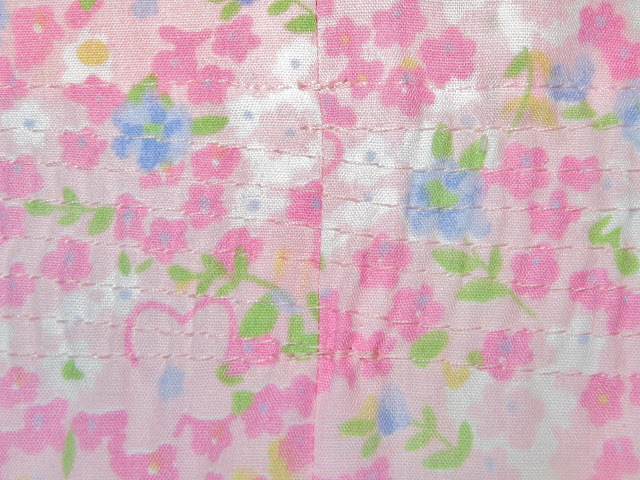 I’m on a wide hem kick right now, so I left 2½ inches for my hem. 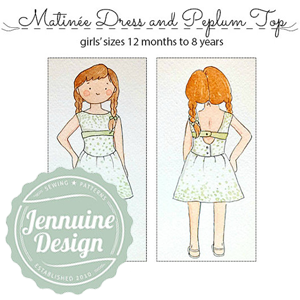 Follow the adult chart, replacing the 32-34 with the entire waist measurement of your child. Unless you are teeny tiny (like a size 0) this should work for you. I’m a size 6 4 and had plenty of room even though my fabric only totaled 60 inches wide instead of the regular 64-68ish called for. 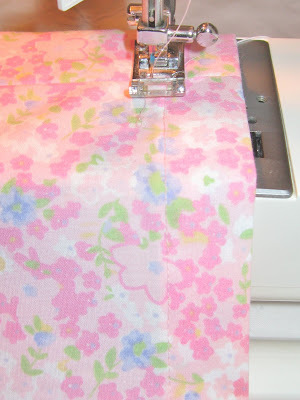 Fold the top edge under ¼ inch and iron a crease. Then fold the same edge over 1 inch and iron another crease. Ok, Now that you have your fabric ready, here we go! 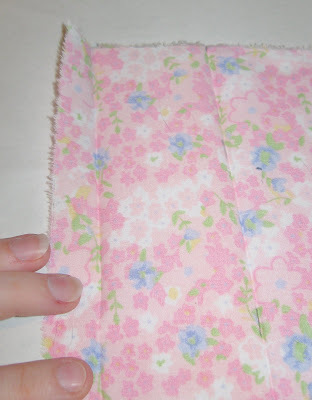 Fold the rectangle right sides together and stitch along the short side (using regular thread). Seam allowance is up to you, but I usually just use the edge of my presser foot. Do whatever feels comfortable. It won’t change the end result. Press open the seam and refold the creased edges. 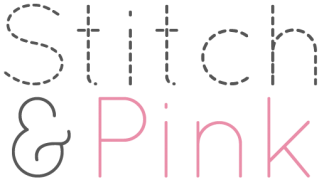 Now you can stitch down the hem and top edge. 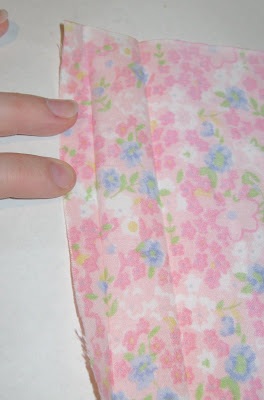 Handy hint: use a piece of masking tape as a guide for a large hem. Then you can easily peel it off when you’re finished. 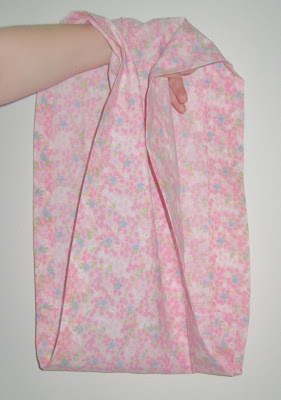 Before adding the elastic, your fabric should be a tube like this. (Make sure your fabric is RIGHT SIDE UP!) Line your presser foot up with the stitches you sewed along the top edge. (I kept my rows only ¼ apart. If you make them too far apart it will change the look) Keep your stitching parallel until you get around to the beginning again. Then angle your line down to form the next row of the spiral. I just keep using the ¼” mark on my presser foot as a guide. 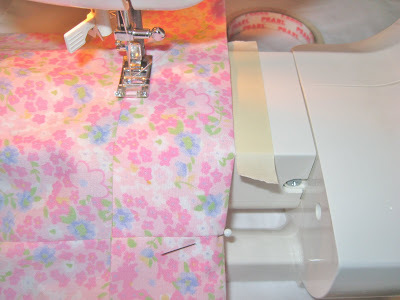 Keep going round and round until you reach your desired length and stop at the side seam. Make sure you back stitch at the beginning and end, and it doesn’t hurt to tie the 2 threads into a knot before trimming them. (I’ve never had anything unravel, but just in case.) Hit it with some steam or mist will a spray bottle & press. It will shrink up even more in the wash. This is a close-up of the beginning and end of my spiral. This skirt had 7 rows, and the ladybug had 6 rows. 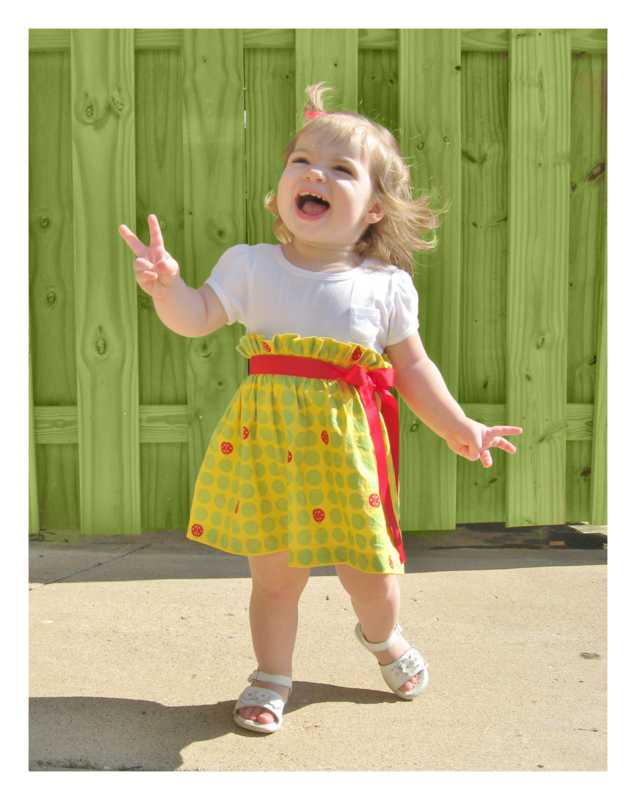 The larger the skirt you are making, the more rows you will need. Now add a belt or a length of ribbon and Voila! Pop it on your kid and add their picture to my Your tART flicker group. I bet you had so much fun, you want to make another one right? Let’s make a skirt for you this time. You know you deserve it, especially since you are always making such amazing stuff for other people. Consult the chart above and cut out your rectangles. I made my upper edge casing smaller because I didn’t want mine to have that “paper-bag” look. 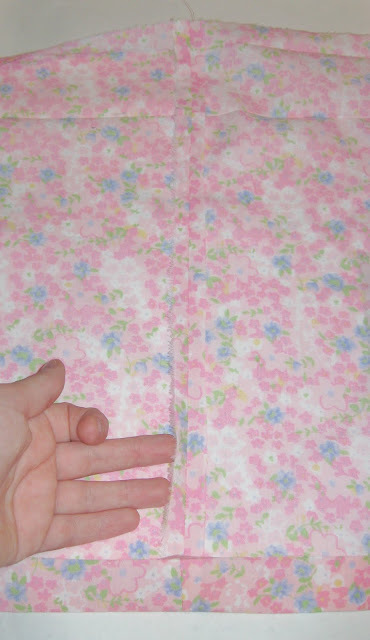 If you want the ruffle type edge completely gone, thread a piece of regular elastic through the casing. These were taken before I hemmed it, so that you could picture it as a high waist what I’m calling the “dress” look, (not very flattering on me) and also just a regular old skirt. Ok, so I am one of the most un-photogenic people on the planet, and it just so happens that every time Ant takes my picture he makes me look fatter (Thanks Honey!). Put that together with a tank-top that makes the girls look huge and we don’t exactly have a winning combination. But, I wanted you to be able to see the adult version of the skirt. You are now ready to go forth and shirr til your little heart is content! 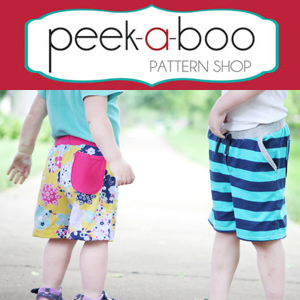 If you’re up for something a bit more exciting, use this great tutorial from Jessica at Running with Scissors and add pockets! P.S. I’m sure you have all figured out how easy it can be to change the size of the rectangles and make something other than a skirt. 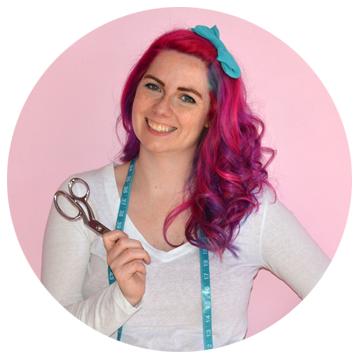 If you’re still a bit leery though, I’ll be sharing another tutorial on Monday about how to make a top/dress. See you then! 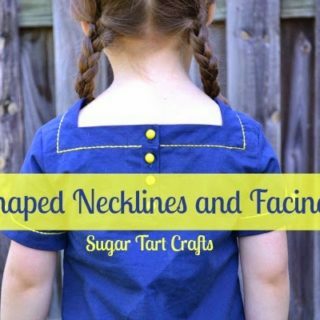 I'm pregnant right now and would LOVE to make one of these-it looks like I could wear it right under my belly until baby is born and then wear normally afterward, it would sure help with this heat! Thanks for the great detailed tutorial! 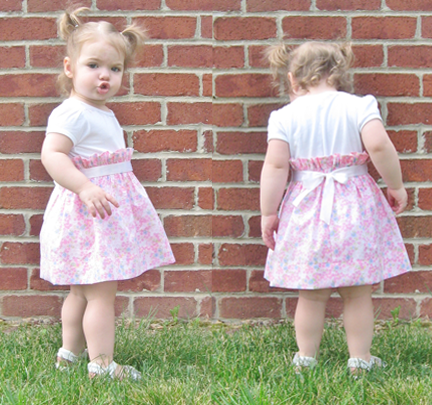 I made something like this for my baby but I never thought to make it a little longer and high waisted! So cute!! I am visiting from Tatertots and Jello and I would love if you would link this up this weekend to my Delicately Constructed Fridays linky party!! This is so pretty! I would love it if you would link up to my Tuesday Confessional link party going on now: http://www.craftyconfessions.com/2011/06/tuesday-confessional-link-party.html. I hope to see you soon! this is a very cute skirt. Hi Toni, This is really cute! I have a two year old and this would work great for her! 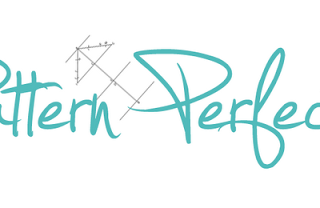 I am following your blog now and would love a "follow back" if you have time! 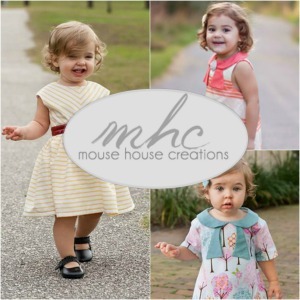 Look forward to seeing what you make for your little one and then trying my hand at it for mine!